Washington Post A Mashable survey showed candy corn – or “Satan's earwax” – is the most hated candy in 21 states. The thing that is hard to grasp about candy corn-flavored candy – not candy corn, but other candy that tastes like it – is that it's a candy defined more by its texture than its flavor. What is “candy corn flavor,” other than slightly caramelized sugar? Isn't candy corn-flavored candy just ... sugar-flavored sugar? These are the mysteries of the universe that arise, like ghosts, every Halloween – aka candy corn season. Some people will never grapple with any of these questions because they will never let a kernel of candy corn touch their lips. It is one of the most controversial sweets. “Satan's earwax,” they say. Brach's Naturally-Flavored Candy Corn (Gluten Free): If candy corn is just a little too orange for your liking, there's an all-natural alternative: Brach's, the candy corn kingpin, has a version of the candy that is colored with beta carotene and turmeric instead of yellow 6, yellow 5 and red 3. It's also gluten-free, and has a wholesome-looking packaging design to trick you into thinking it's a health food. It looks pastel, and the exterior of the candy corns appeared slightly cracked – spooky! It tastes exactly the same as the regular candy corn, I promise. Brach's Maple Candy Corn: These candy corns come in varying flavors of khaki, and they look a little like coffee-stained teeth. They do not actually contain maple syrup, in case you were wondering. They are ... fine, if you're into that sort of thing? They taste sort of like the flavor packets you'd put in oatmeal. The combination of maple and candy corn is a pretty controversial marriage of unpopular flavor and texture, so I salute this very bold decision. Brach's Pie Favorites Candy Corn: Two flavors, one bag. There's the reddish-orange candies, which are apple pie-flavored, and mostly taste of cinnamon with a hint of artificial apple. And then there's the brown candy corn, which is pumpkin pie-flavored, and tastes vaguely of medicine and bubble gum. Not everything needs to be pumpkin spiced. Brach's S'mores Candy Corn: They have a dark brown chocolate base, a white middle for the marshmallow and a light-orangey-tan-colored tip for the graham cracker, which is sort of clever. Do you like Tootsie Rolls but wish they had a less-chewy, more crumbly texture? Then you'll like these. Sour Patch Kids Candy Corn: We were expecting this to be a gummy Sour Patch Kid molded into a seasonally appropriate Halloween shape. Instead, it was a fruit-flavored candy corn covered in Sour Patch dust, a marriage of texture and flavor that was slightly unsettling. Still, it works, in a weird way. At least it was better than the pumpkin pie candy corn. It comes in orange and grape, and the latter is surprisingly good. I wouldn't recommend this for anyone over the age of 11, but I bet it would be a hit at your kid's Halloween party. M&M's White Candy Corn: They're M&M's in the traditional candy corn color scheme of white, orange and yellow, and that's where the similarities end. They taste like white chocolate. They are white chocolate. White chocolate is the worst flavor of M&M. Pass. Jet-Puffed Candy Corn Mallows: Did you know that marshmallow was an ingredient in the original candy corn recipe? These marshmallows are shaped like candy corn, but they're more marshmallow-flavored than candy corn flavored. They'd be a good topping on Halloween cupcakes or Rice Krispie treats. Trader Joe's Candy Corn Popcorn: It's a thick, candy-coated kettle corn that comes in candy corn colors, and it is really good. You could inhale an entire bag of this. It's like the best possible form of Cracker Jack. It doesn't particularly taste like candy corn, but what is candy corn flavor anyway? Who cares? 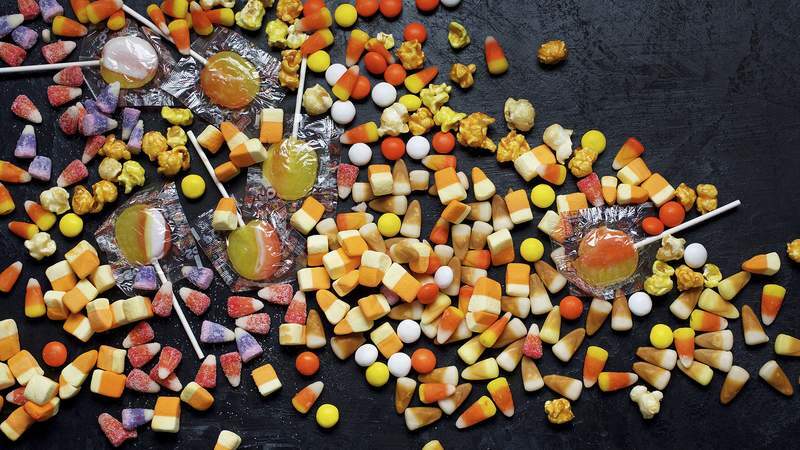 Charms Candy Corn Pops: This is what you get for your trick-or-treaters if you hate them.